For Giving Tuesday, Island Conservation’s Director of Philanthropy, Rachel Wadsworth, shares why she loves her work. This Giving Tuesday (today), I want to take time to reflect on generosity and gratitude – two qualities that continue to inspire and motivate me in my career. As a professional fundraiser who has worked in conservation for almost ten years, I have had countless opportunities to experience both qualities in equal measure. That’s part of why I have the best job in the world. Every day I get to work with people to help them make a difference in the world through their philanthropy. The generosity I see every day has made me a better, more hopeful person. I’m inspired to do more and to be more philanthropic in my own modest way. Generosity often takes the form of the financial support that Island Conservation and so many other worthy organizations receive from our donors, in life and after passing. Every donation, whatever the dollar amount, is transformational because it represents the desire of the donor to be part of a bigger cause – to pursue a mission and to transform our shared planet for the better. Thanks to support from donors and partners, Pinzon Tortoise hatchlings are able to survive in the wild for the first time in 150 years. Donors who choose to make estate gifts leave an extraordinary legacy of generosity well beyond their lifetime. I have been deeply touched by the trust and confidence these donors place in us to carry forward their wishes. I am often moved by the generosity of spirit shown by donors who believe deeply in our mission, introduce us to their family and friends, and seize every opportunity to engage with our work. Theirs is the generosity of time and presence. Fundraisers often speak of those who give “time and treasure” to the organizations they support, and each is equally valuable in its own way. For the gifts of time and treasure I say thank you to my colleagues and all who support Island Conservation and others who fight the good fight. Which brings me to the second quality – gratitude. 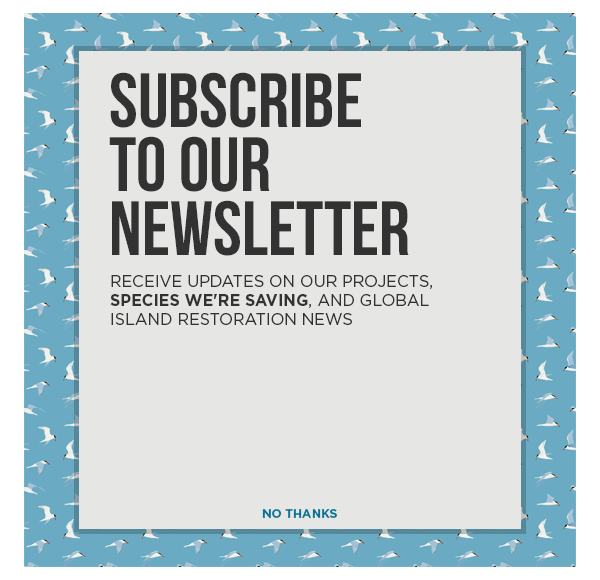 I hope it’s obvious by now the enormous amount of gratitude I feel for all of you reading this blog and all those who have supported Island Conservation over the years. I feel gratitude for the meaningful relationships I have built with supporters and volunteers who welcome me into their homes and lives. I feel gratitude for the time I have spent in nature – at rest and in motion – with colleagues and board members. I feel gratitude for the friendships that my work has brought into my life and for the opportunity to work with committed and passionate people who wake up every day trying to figure out how to make the world a better place – one seabird at a time. I hope you will be generous on Giving Tuesday to Island Conservation and to all the other causes close to your heart. For this, you will have our gratitude. Rachel received a Bachelor of Arts in Art History and Middle Eastern Studies from Wellesley College and a Master’s Degree in Art History from University of Massachusetts, Amherst. Prior to joining Island Conservation Rachel served as the Director of Resources for The Nature Conservancy’s India Program and as Associate Director of Philanthropy for the California Chapter. Rachel’s passion for the natural world fits perfectly with her love for trail running. In addition to covering long distances by foot as an ultramarathon runner, Rachel enjoys road trips, particularly through the West and Southwest.